Double Your Productivity In 2019 — Guaranteed! Your Productivity Starting Right Now? Imagine... if you could get twice as much done in your life, without working more, or spending any more of your time. What would it mean to your business? To your feeling of being successful and making an impact? So how do you increase, let alone DOUBLE, your productivity? ...Especially when you're already working at maximum capacity? How do we take more time off to get the rejuvenation we need, when we have so much to do? How do we deal with the increasing distractions and interruptions that are taking our attention away from the high-value work that makes us the most money? How do we systematize our productivity, and create habits that work for us naturally and automatically every day? How do we identify those activities in our life and business that will give us the highest possible return, and make us the most possible profit and income — and then design our lives so we make sure to do THOSE money-making actions consistently? If you're ready to double the productivity in your life and work, then I'd like to invite you to join me for the next 90 days... learning the system that I call "Wake Up Productive." I call it Wake Up Productive because if you go through the program — which only takes about 30 minutes a week — by the end of the training, you'll literally wake up twice as productive, I guarantee it. We will install two new habits — one in your personal life, and one in your business... and together, these two new routines will literally double your productivity. First, I want to tell you that this program is not an "all at once" training. Some things can be "crammed" and learned in a day. But productivity isn't one of them. You already know that, if you've tried to change a habit in one day. The reason why we spend 90 days together, and do little "baby steps" of 20-30 minutes a week with implementation exercises, is because we want to create change that sticks... not just a flash in the pan. The purpose of these introductory sessions is to "download" everything on your mind that's weighing you down and stressing you out. We'll then identify what to focus on for the biggest results in your life and business — and learn a new way to think about creating habits. running when we start the main weekly sessions. that will grow your income and profit. The problem with most programs is that you get so much information it's very easy to get overwhelmed and not know where to start or how to implement things..
One of the most important parts of Wake Up Productive is how it is designed. The training is intentionally broken down into 12 weeks — and each week you learn ONE new productivity habit and how to implement it in your life. You then get the entire next week to practice that habit and develop it into a muscle… This means each week you are only practicing one thing — and that's why this training is so effective. We are literally building your productivity as you go through this program, because each week builds off the previous week, so you never get overwhelmed and you are implementing the program as you go through it. "The material in Wake Up Productive is presented in small digestible segments. You're given time to implement and integrate the methods instead of being overwhelmed by just more info. Eben explains actionable steps and the science and research to support them. This program is fun, easy to learn, and effective." "Like all of Eben's materials, the ideas in Wake Up Productive were presented in such a way that I immediately thought 'I get it!' On top of that, they're given in bite-size chunks that are easy to implement right away. The result is that unlike so much of the information I consume, for the past year the ideas I learned in Wake Up Productive have been a part of my daily routine." 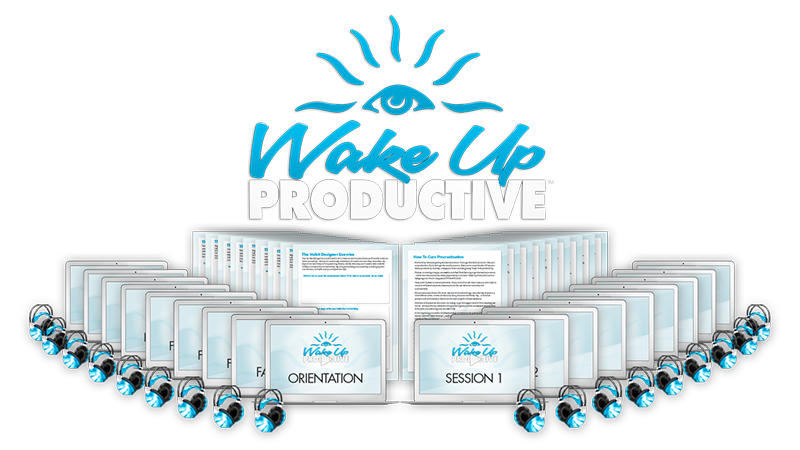 "Wake Up Productive' gave me a systematic step-by-step instruction and tools on how to improve my physiology and mental focus. Each video in the program built up upon earlier learning and soon I was waking up excited about my day and the things I had planned." The great thing about Wake Up Productive is that isn't a bunch of recycled time management stuff from 20 years ago. There are no planners, no checklists, no complex systems with note cards to confuse you... or to lose. In Wake Up Productive we focus on putting 2 things in place: Your personal success ritual, and your business success ritual. And we take a full 90 days to do it, so you have plenty of time to learn each step, and get it right. Changing habits doesn't happen overnight. That's why we're going to work together for 90 days... to make sure that they are designed right, implemented right, and that they STICK. And my promise, and guarantee to you, is that if you'll go through this 90 day program, invest just 30 minutes a week working on your productivity, and you implement what you learn in your life and business, you'll double your productivity. This program is designed to help you win the “Inner Game” of money. It shows you how successful people think about money and how to use money as a tool to create business and personal wealth. In this valuable 10 session course, you’ll discover how to create your own “money mastermind” that can automatically rewire your brain and behaviours for success with money. You’ll learn the most powerful money mindsets… how to create the motivation to take action every day and do the most important things that can bring a lot more money into your life… and much, much more. The value of my Money Psychology course is $197 if you purchase it separately, but you’ll get the entire course today as a bonus when you register for Wake Up Productive. This program helps you identify your natural gifts and talents… then it shows you how to connect them to the biggest business opportunities that exist right now. By doing this, it’s possible to create a high income for yourself doing work that you were born to do… work that is so fun and enjoyable, it doesn’t even feel like work. This is especially valuable if you’re in a full-time job right now, but want to create extra income on the side, or you want to completely leave your job and start your own business. And if you’re already an entrepreneur, it could serve as the basis of a new business idea for you and can help you identify areas in your current business that could create lots of new profits as a result of your “hidden” talents and gifts. Turning Your Talent Into Income is $197 when purchased separately, but you’ll get the full program as a bonus when you register for Wake Up Productive today. Whether you’re already a business owner or thinking of starting a business, this program walks you through the principles and strategies you need to succeed quickly and at a high level. In it, you’ll discover how creativity and productivity go hand in hand … how to innovate … how to surround yourself with a superstar team … and much, much more. I invested 2 years creating this course, and it’s the most condensed course I have for how to succeed launching and building your own business. These are proven gems of wisdom that are like having a seasoned, business mentor by your side, guiding you as you are starting out with your own business. How To Be An Entrepreneur is $197 when purchased separately, but you’ll get the entire program today as a bonus when you register for Wake Up Productive. This is a series of 6 classes led by me, where we go deeper into the Wake Up Productive material you’re learning… and I teach you how to specifically apply it to growing your business and profit. In these classes I teach more advanced sessions on business growth, marketing, and even investing - and share the newest methods I’ve been using to grow my business and my financial success. When you install the systems and habits from these classes into your business, it’s possible to create business rituals that automatically focus you on most valuable money-making activities in your business. When the most valuable things happen in your business every day, automatically, it’s possible to shift your business into high-growth mode and create the kind of business and lifestyle that most people only dream about. Like your other bonuses, if you purchased this training separately it’s $197… and that’s an incredible bargain for these high-growth business classes… but right now, you can get all six classes as a bonus when you register for Wake Up Productive today. Over the past few years, I have been traveling for most of the time, and it has given me a new perspective on what it means to become more productive in my life and with my family. It has forced me to take my own productivity to a much higher level. So in order to share with you what I’ve learned, I’ll be doing a live training called Superhabits. In Superhabits, you will learn how to create automatic habits for learning, and for your relationships. We’ll build new structures in your life that lead to you doing the important things that will help you create not only more business success, but also more personal and relationship success as well. If you are building a virtual business, or facing the struggles of working from home or while traveling, then this course will be particularly valuable to you. You’ll get to join me for the live creation of this class, so that you get the transmission first, while it’s fresh. And if you can’t make the live event, I will also give you access to the final course as well, so you don’t miss it. Once this course goes up for sale, it will be $997. Through this special offer, you get it free. With Wake Up Productive and the special bonus courses you’ll be getting a total value of $2,282 in cutting edge training today… but you won't have to pay $2,282. Through this special New Year’s offer, you can get everything now for two small monthly payments of just $97. I have another question for you: What is your time worth to you? And what would it be worth to actually double your productivity? Think of it this way: If you take action and organize yourself and your life so that you free up an extra hour every day, that adds up. In fact, the math is that if you increase your productivity and free up just an extra hour a day, that's 9 full-time work weeks. Increasing your productivity is one of the few areas of life where you can make a massive impact, with just a little bit of relative effort. For example, if you earn $25 an hour, and you free up an hour a day — you just bought yourself $750 worth of your time PER MONTH. Or $9,000 per year. If you actually double your productivity, that would mean going from $50,000 earned in a year to $100,000 earned in a year. I'm not promising you're going to make more money — and my guess is that most people who take productivity programs don't take action, and don't increase their income... but think about it for a minute. When you register today for Wake Up Productive you get a full 90 days to try out and use the course — before you decide if it’s right for you. Go through the whole thing. Implement all of the strategies and techniques in your life and business. In my experience you’ll start seeing results very quickly… but you don’t have to decide anything until you’ve completed the entire course. If you complete the course and you don’t think it’s the best investment that you’ve ever made, for any reason, just show me your exercises and homework, so I know that you completed the course, and I will give you a 100% refund - all your money back. And even if you get a refund, I’ll still let you keep the entire course and all the bonuses as a free gift from me, just for giving Wake Up Productive a try. I can’t think of a more fair and reasonable offer than that! "Eben’s Wake Up Productive program has allowed me to create a powerful morning routine that gives me the focused mindset and nutritional launch pad to drive my entire day. I’m waking up earlier, laser focused on the right tasks and achieving more. Amazing program!" — Bob Thordarson, CEO BluCapp, Inc.
“The program to me was like a giant flashlight - it lit up the corners of my head that were dusty, had cobwebs in them. With Eben's help, got all that cleaned up and ... BOOM! Results are up, anxiety and confusion way down. The way Eben coaches you, you CAN'T HELP but make the small but mighty changes and see results right away. The program is in bite-size chunks - super-easy to take action, nothing feels overwhelming. “The material in Wake Up Productive is presented in small digestible segments. You're given time to implement and integrate the methods instead of being overwhelmed by just more info. Eben explains actionable steps and the science and research to support them. This program is fun, easy to learn, and effective. The difference Wake Up Productive has made for me in my life and business is that it has given me structure in my daily routine without being suffocating or restrictive. I have learned how to focus on physical, emotional, and mental health and how to integrate it into the chaos of daily life. I have learned how to schedule and accomplish the difficult tasks for my business. Rather than procrastinating, I get them done. I am literally more productive rather than just being busy. This program has paid for itself many times over. “The program Wake Up Productive supplied me with dozens of effective tools that I was able to implement immediately and still use to this day. From starting my day with a full glass of water to hydrate to tips on focused work production, this program was an incredible bargain. Not only did it provide valuable time saving tools, but it got to the heart of what causes us to procrastinate, over eat, have anxiety and all the little time wasters that occur through habit and emotional states. I highly recommend for anyone wanting to change and improve their life. Not only will they become more efficient with the time but they will also feel better and be healthier. “Wake Up Productive isn’t just another “productivity” product. It should be considered “THE” productivity product. This is more than just time management…it’s helped me change habits and routines to achieve a consistent, higher level of achievement, while helping me “unclutter” my mind. “If you’re ready to actually engage with life more fully, this program offers simple and doable steps to get you moving into the day in ways where so much more can happen, with so much less effort. I have found it to be something that I return to again and again to kickstart new phases of my life." “Eben's "Wake Up Productive" Course introduced me to a set of tools that I wish to have found much earlier in my life. It reveals many secrets about the factors that impact our productivity. For instance: how the human brain works and affects our behavior and results. It made me aware of the decisive role of habits and rituals. Lots of success with your new course. — Denise Antoon, J.D., M.S. “"Like all of Eben's materials, the ideas in Wake Up Productive were presented in such a way that I immediately thought 'I get it!' On top of that, they're given in bite-size chunks that are easy to implement right away. The result is that unlike so much of the information I consume, for the past year the ideas I learned in Wake Up Productive have been a part of my daily routine. “When I first heard about the "Wake Up Productive" program and the results it would bring me, I was a little skeptical. But somehow, I just knew I had to follow this course. Learning a way to be more productive really caught my attention. Ever since I started this program, I slowly built in more time to actually do what is of true importance to help my business grow. I used to get distracted by email and the huge amount of different tasks to fulfil, but now I found a clean and focussed way to do all that needs to be done. At the end of the day I often feel thrilled about how smooth things got handled! Somehow, it's as if I work less hours a day, and yet, I get much more done than I did before. I know it sounds crazy, I would think the same way a few months ago when I would read a thing like this. But really, Eben gave me a very good way to handle my time so I can work with much better focus and choose those things that bring me the best results for my business. Every day I'm impressed about it again and again!